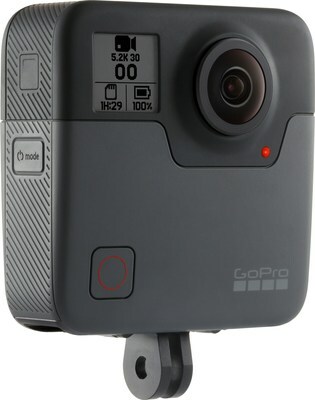 GoPro Ships First Fusion Pilot Units | GoPro Inc.
SAN MATEO, Calif., July 11, 2017 /PRNewswire/ -- GoPro, Inc . (NASDAQ: GPRO) today announced that it has shipped the first Fusion pilot units to production teams at the Golden State Warriors , USA TODAY NETWORK, FOX Sports, AccuWeather, Digital Domain , Getty Images , Legend 3D, Inc., Rapid VR, RYOT, and travel vlogger Louis Cole (FunForLouis). In April, GoPro began taking applications from content professionals seeking to be among the first to use GoPro's new 5.2K spherical camera as part of a pilot program to produce inspiring content that demonstrates the creative potential of Fusion. This first wave of pilot partners represents well known brands, agencies and talented content professionals who are actively pursuing the use of spherical and 360-degree cameras in their productions.
" GoPro has always looked to our creative community to really show us what our products can do. Given Fusion may be the most versatile content creation tool ever made, we're expecting big things," said Nicholas Woodman, founder and CEO at GoPro. "We are excited to get Fusion into the hands of creative professionals, both to see the content they create and also to receive feedback that helps us refine the overall user experience for when we launch Fusion to a broader audience later this year." GoPro carefully selected these initial pilot partners from a pool of more than 20,000 applicants to address a broad segment of potential use cases for Fusion, from news and weather to sports and folks diving deep into the nascent medium of immersive storytelling. Anthony Holland Parkin, Head of VR, Getty Images, said; "We are excited that our photographers and videographers will have the chance to pilot Fusion and create some truly immersive content. The diverse range of 360 content that we produce - from the red carpet to frontline news - allows people to access information and experiences that were previously off limits and we can't wait to see how Fusion will enhance this offering." " GoPro's efforts to advance immersive capture are impressive and we're excited to get our hands on Fusion," said Michael Davies, FOX Sports SVP Field & Technical Operations. "We have a great slate of programming we're hoping to experiment with using Fusion, including the CONCACAF Gold Cup, UFC and NCAA Football season this fall." The application process for the GoPro Fusion Pilot Program remains open, and GoPro expects to add more pilot partners to the program later this summer. A limited commercial release of Fusion is expected by the end of 2017, with details on pricing and other technical specifications being provided at launch. For more information about Fusion, visit GoPro's blog, The Inside Line, and to apply to become a pilot partner, please visit https://gopro.com/fusion. About GoPro, Inc. (NASDAQ:GPRO) GoPro, Inc. is transforming the way people capture and share their lives. What began as an idea to help athletes self-document themselves engaged in sport, GoPro has become a mobile storytelling solution that helps the world share itself through immersive content. GoPro, HERO, Karma and their respective logos are trademarks or registered trademarks of GoPro, Inc. in the United States and other countries. All other trademarks are the property of their respective owners.